Today's post is brought to you by the Letter "J". Today is one of those days I wish I had settled on a theme, however I did not and most concentrate real hard to come up with a great topic. You see the secret to a success blog, or radio program, or TV Program, is content. 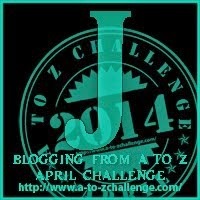 This year's A to Z has some great writers and some great content. Last year I was doing some travel bits, and it was easier, this year, I was not so prepared. So today I think I will discuss, Junk in the Trunk. Seems like a subject that could be fun. This is not an Adult Content site, so its not THAT. Many people keep a few things in the trunk. On any given day, can you name five things you keep in the trunk? Here is a list of my Junk in The Trunk.